This is the second post in a series about Cuba that begins here. I searched for my photos from Cuba and since I was well organized back in the day when we printed photos and put them in albums, I was able to find them quickly. I realized it’s been 12 years since I went to Cuba. That adds weight to my disclaimer that things have changed from what I’m going to describe. Mainly, everything has gone downhill. I met my fellow travelers in the Miami airport. There were two dozen of them and I must have brought the average age down to about 60 when I showed up. They were pretty much as I expected; all the men had grey beards and ponytails and the women wore long tie-dyed skirts with Birkenstocks. They were a nice bunch of people, mostly couples but as usual on tours there were a few divorcees who put the tank in cantankerous. Ed was our leader. 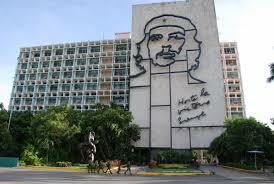 He had been to Cuba many, many times and he would be indispensable in interpreting what our guides said. Not because they spoke Spanish—because they had to speak Propaganda. Of course Ed had his own agenda, so much remained a mystery. All the other people waiting for the flight to Havana were Cuban Americans, and they also fit a stereotype. Picture Desi Arnaz, then picture him about 30 pounds overweight, wearing an untucked-in Guayabera shirt, the flashiest designer sun glasses you’ve ever seen, dripping with gold chains, bracelets, rings, and a watch as big as Big Ben. What struck me almost immediately upon arrival was that there was no advertising. There was propaganda galore—on wall murals, billboards, and ubiquitous images of Che and Fidel and other revolutionaries. But there were no billboards for products like laundry detergent or for stores or restaurants—because there were no stores or restaurants. There was almost nothing to buy, anywhere. But who needs stores when everything is provided by the state? “From each according to his ability, to each according to his need,” is the saying popularized by Karl Marx. 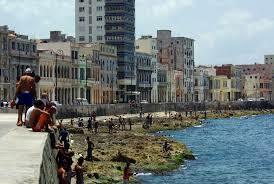 Every Cuban got a house, medical care, electricity, food, an education—and cigars! The house might be about to collapse, the electricity might be out for hours a day, and the food might be basic (rice, chicken, and beans), but they could all depend on their monthly rations. Everyone had a job, too. I had doubts about whether “ability” was factored in. I used a restaurant bathroom and was dismayed to find the toilet was broken. An elderly woman appeared with a bucket of water and dumped it in. Was that the best job they could come up for her based on her ability? No, Ed explained. Aside from professions like physicians, everyone was just assigned a job that needed doing. Or a job that didn’t need doing. These “make-work” jobs were in evidence everywhere. We were told to get in a van so we could be driven 25 feet from Point A to Point B at the airport. There were people sweeping clean sidewalks and guards guarding empty buildings. All of them—doctor, driver, toilet flusher—earned about the same per month. There was one government-sanctioned store called a dollar store. American dollars are the currency in Cuba, and I mean cash. There were no ATMs, no credit cards or checks accepted anywhere, even at the hotel. What was for sale in the dollar store? Nothing touristy, and nothing for a dollar. Everything was expensive. The store was tiny but packed in everything from clothing to washing machines. It reminded me of an old timey Woolworths, with no American goods, of course. There was an appliance brand called Vince which I assumed was Spanish or Italian. Trade with Cuba was in defiance of the U.S. Government, Ed said later. Spain was also financing renovation of the historic waterfront, the Malecon, on and off—the pauses due to bullying threats from the U.S. This entry was posted in Budget travel, Cuba, Culture shock, Poverty, Socialism, Travel and tagged Cuba, human rights, Socialism, travel on January 21, 2016 by Breaking Free.